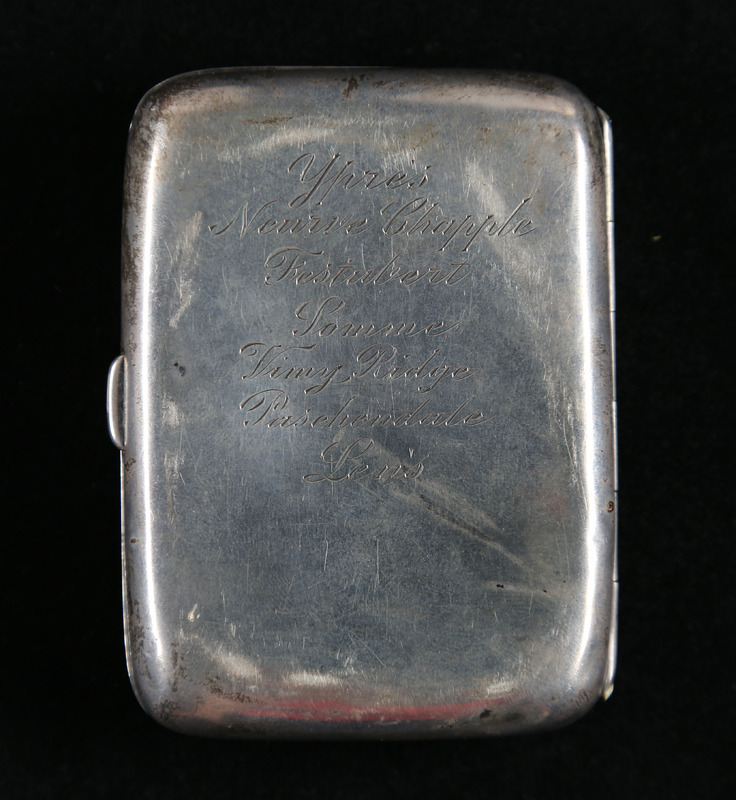 Harry Colebourn's cigarette case listing major battles fought by Canadians. When Britain went to war in 1914, Canada followed. As a colony its foreign affairs were handled by London. Most Canadians welcomed the war anyway. Prime Minister Robert Borden faced no significant debate in Parliament. Opposition leader Sir Wilfrid Laurier encouraged Canada to “answer to the call of duty, ‘Ready, aye, ready!’” French Canadian politicians such as Henri Bourassa, traditionally wary of the British Empire, initially rallied to the cause. Borden quickly promised a contingent of 25,000 men, set aside $50 million for war appropriations, and secured for the government sweeping powers at home through the War Measures Act. By October 1914 33,000 Canadians had volunteered. In March 1915 more than 36,000 set sail for war with the Canadian Expeditionary Force. Within a year 150,000 were in service, seriously taxing Canada’s military resources. Many were British immigrants, unemployed, or those in search of “adventure.” Hoping that the enthusiasm would last, in early 1916 Borden pledged 500,000 soldiers: a sizeable number for a nation of 7.5 million. But the shock and horror of war tempered Canadians’ support. While 330,000 men were raised the shortfall opened a serious rift. English speakers accused French Canadians of not doing their share. Quebec nationalists warned that English imperialists, not Germans, were the real threat to French Canada. News of the worsening war, a manpower shortage at home, and high wages motivated some to avoid service altogether. In May 1917 Borden abandoned an all-volunteer army and moved for conscription. The political crisis that followed divided Canadians, and did little to meet the demand at the front. In battle Canadian soldiers distinguished themselves with honour under British command at Ypres, Passchendale, the Somme, and elsewhere. They were often considered the best “shock troops” in the Empire. In April 1917, four Canadian divisions fought for the first time as a unified corps at Vimy Ridge: for some historians a catalyst in the development of a truly “national” identity. By 1918, approximately 620,000 Canadian soldiers had joined the war. More than 56,000 died and almost 150,000 were wounded, making it proportionately the bloodiest conflict in Canadian history. Canada also contributed through huge exports of wheat, munitions, and other goods. The government raised billions through its citizens in the Victory Loan campaign. It also implemented a national income tax and grew the debt six-fold between 1913 and 1918 to help pay for the war.